Whether you’re visiting Thailand or looking to buy or rent a condo or other property and call the country your home, you are likely to find yourself in need of the basic necessities from time to time. From food, to personal hygiene products, and more, Thailand’s many supermarket chains offer everything you need for day-to-day living at affordable prices. If you’re not sure which chain is right for your shopping style and needs, check out this list of some of the most popular supermarkets in Thailand. Tops Market is the largest supermarket chain in Thailand. They operate 147 stores across the nation, 92 of which are located in Bangkok. They offer mostly Thai food, though their larger stores situated in some big malls also have a wide variety of Western favorites. Their high number of locations and large inventory makes them a great everyday grocery option. If you’re looking for a higher-end food option than your average supermarket, Gourmet Market might be just the place. While they only have four locations, and all are in Bangkok, Gourmet Market offers food that you can’t find anywhere else. You’ll pay more here than you might at other stores, but if you’re looking for quality gourmet food, they can’t be beat. Japanese expats will enjoy this little slice of home. 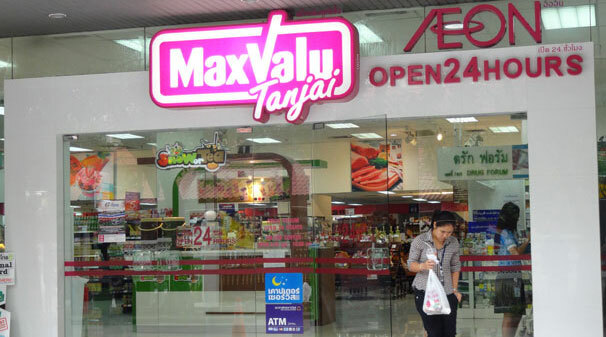 Maxvalu is a Japanese supermarket that operates over thirty locations in Thailand, most of which are located in and around Bangkok. Open twenty-four hours, these moderately sized stores may be smaller than many of Thailand’s other chains of supermarkets, but they offer a range of grocery options, including fresh fruits and vegetables, all at reasonable prices. If you’re looking for housewares, electronics, and more alongside your everyday grocery needs, Big C is the place to go. There are 121 of these so-called hypermarkets around Thailand, including 49 in Bangkok. They are one some of the largest supermarkets in Thailand, which makes them great for one-stop-shopping at very competitive prices. Be aware, if you live in one of Thailand’s cities and usually rely on public transportation to get around, Big C’s are often located away from downtown areas. While these Thai supermarkets are a collaboration between Tesco and Lotus, British expats will enjoy the similarities they share with the popular British supermarket, Tesco. They operate both smaller, express stores and larger locations that have a large inventory of Western and Thai goods. There are a mammoth amount of Tesco Lotus locations in Thailand, many of which are are the express stores. Buying non-perishable food and other items in bulk is a great way to save money over time, and to reduce the number of times you have to go shopping each month. If you’re looking to buy in bulk, the best place in Thailand to do so is Makro. There are 48 Makro locations in Thailand, including 9 in Bangkok. But like Big C, it can be difficult to get to a Makro location, and even more difficult to get your bulk-purchased items home, if you usually rely on public transportation.